Best time tracking system software for a person or small business! 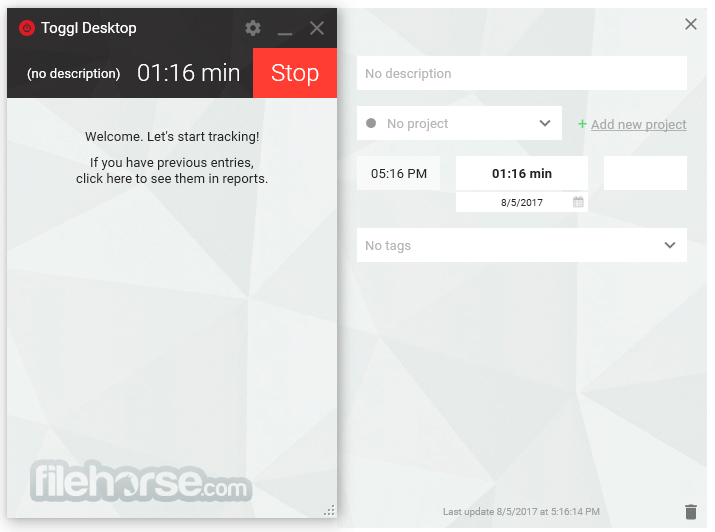 Toggl Desktop is a small desktop application that will help you track time more conveniently. It sits quietly in your system tray and when you need it (to start/stop/edit your work), it’s quickly accessible. It does what it’s designed to do best – tracks time. Toggl Desktop for Windows is a native Windows application that can be installed on your computer. It works seamlessly with the web version of Toggl, syncing data on the fly. Toggl for Desktop PC works also offline. It stores data locally and sends it to the Toggl server once you’re back online. Tracking time with the desktop agent is as simple as it could possibly be. Just fill in the details of the job you’re doing and click on the green “Start” button to start the timer. If you start the timer first and wish to add the details later, just click on the timer and a window appears where you’re able to edit the description, start/stop times and the project. You’re also able to add tags and decide whether the entry is marked as “Billable” or not. It makes time-usage graphs colorful and adds spice to time tracking. Gives you wiggle room for job tracking. Great for companies with many different departments and teams. Makes the project manager’s life a lot easier. View the dashboard: Compare current tracking data with the previous week to see who’s Employee of the Week. Because some hours are worth more than others.